After several weeks of trying I finally had to give in to my sweaty and now pruney hands. I could not get the heat out of my Ubuntu install on my T60p laptop. I tried everything…CPU monitors, tuning down the speed, blowing out the vents, BIOS changes, and all that. Last night I grabbed the Fedora 10 installer, burned an ISO and re-booted. I completed my install this morning and although these two distros have a lot in common, they also have some definite differences in how they work. Installing Fedora was quite easy. I simply went to their website and downloaded the ISO for their bootable OS. It is 638MB so it takes a while get grab. After a couple of beers (a DAB lager and a Flying Fish HopFish IPA) I was ready to burn a DVD, reboot and up came a complete Fedora distro running on my laptop. After a quick check to make sure I could get a WiFI connection, that my graphics card was working, and that my CD/DVD burner was working, I clicked on the desktop icon to initiate a full install. The installer starts up and is easy to use, just answer the questions and off it will go. I did choose the option to remove all partitions and start over from scratch. The install took about 10 minutes to complete and after a reboot I was good to go. I have Fedora 8 on a workstation so I’m pretty familiar with this distro and all seems familiar. The interface is snappy and performance looks pretty decent. It was a bit of a chore getting Open Office installed..its nearly impossible to find the right crap in the software managers on Fedora. Instead I downloaded it from the openoffice.org and installed it myself. That was ok – but if you try this, you must run the GUI installer as root. Compared to Ubuntu this is a pain. On Ubuntu there was a nice and easy install process with their add/remove programs widget. Installing other things on Fedora was easier or unnecessary – for example the ATI graphics drivers. On Ubuntu I had to install extra “proprietary” drivers; on Fedora everything seems good to go. Hands down – super cool (lol – no pun intended) – this package can monitor everything from CPU speed, to fans, toPCI cards. Its very easy to install and very easy to configure. You can see in the screen shot that I’m monitoring CPU temp, hard drive temp,GPU temp, the main fan speed, and the CPU speed. Running the machine now while connected to my WiFi network it is quite a bit cooler than my Ubuntu machine and there is much less fan noise. I can’t explain why, but it is definitely different. I’m thinking it has something to do with graphics card drivers. Even with the full desktop effects running (the bouncing and bendy windows) things are running cool at about 82F for the CPU and 135F for the GPU. I’ve been using more of the laptop features like suspend/resume and most things operate very much the same, however the WiFi re-connection after suspend is much more reliable on Fedora. Most of the time this works, but on Ubuntu it didn’t resume properly most of the time – forcing a restart. In Fedora, Go to System=> Administration> Add/Remove programs (This is PackageKit which will be adopted by Ubuntu too in their next version). search for openoffice or click on package collection and click the appropriate group. Pretty easy. More questions? Feel free to drop me a mail anytime. No – that’s terrible! Which package? Which version, 2 or 3? Of course you get nothing at all if you happen to search on “open office” instead of “openoffice”. If you click the “Office” category you have to scroll around until you find and select all the right packages again. While I agree that this software package is better for power users, for the novice it is no good at all. Ubuntu it was quite a bit easier. In either case it is easier to just download the software and run the installer without using a package manager…as long as you know to do it as root. You may want to give a try to Mandriva 2009.0. 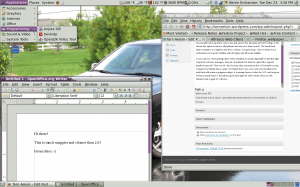 You will have : kernel 2.6.27, KDE 4.1.2, GNOME 2.24, OpenOffice.org 3, Firefox 3, easy to use tools and package manager. Please note that the One edition contains the fglrx drivers ( ATI proprietray ones ). I’ve heard of Mandriva, but never tried it. I’ve got all those things you mentioned in Fedora at this point so unless something starts to annoy me, I’m sticking with this for a while. I’ve enabled all the desktop effects now on Fedora – super cool stuff. can’t we all jus……just get along! Fedora is better !!! FACT !!! Fedora is more stable and faster than Ubuntu. I’ve been told that rpm-packages have problems with dependencies (the dependency hell), unlike deb-packages, that should be flawless. I have only positive experience with the Fedora packagekit, which solves every dependency, so in that particular case the package issue equals these two distributions. I believe also that the Canonical distro has got a little too much hype lately. It’s time for Fedora to get the attention now. Well, try Linux Mint and you will see a real easy linux distro in action. Both distro’s are very good. They both are great choices, but I see the power user going Fedora and a more mainstream user going with Ubuntu, although I do think Ubuntu has to figure out this issue with laptops and heat. That’s a killer to me. i tried OpenSuse 11.1, and it was good, but i was using the KDE desktop so maybe that’s why i prefer Ubuntu since it uses Gnome. also, my hardware is brand new, and still no driver issues. Sound great – my major complaint with Ubuntu was running it on a laptop and the generation of a ton of heat. i’ve had several other OS’s on the laptop so I knew it was nothing to do with my hardware. With Fedora I run a lot cooler. The difference beyond this – as you point out – are probably mostly preference and what you really want to do with the machine. Wait a few minutes (depending on your network speed) and its done. Much much easier than downloading it from openoffice.org, plus since you are using the Fedora version, you will automatically get updates as they are released. I just bailed after a year of using Ubuntu-Ibex was problematic when I loaded it and I was getting tired of the vast memory usage/sluggishness of Hardy. It was a coin toss between running Fedora 10 or Debian Lenny and Debian won out completely by chance. I’ve spent time being distro promiscuous before, and comparitively speaking Debian stacks up really quite well. Though I must say I’ve heard lots of Good stuff about Fedora 10, I no longer find as much joy in switching distributions every week so I probably won’t get around to trying it out for awhile yet. Hi! I am a non-technical guy (meaning I hardly understand a thing about computers!) I’ve been using ubuntu for a while now after switching from Vista. I found Ubuntu to be so smooth and less resource consuming compared to Vista. With Vista on my laptop, the fans were always on. With Ubuntu my laptop used to be extremely cool. Correct me if I am wrong. Does Fedora use much lesser resource than ubuntu and yet delivers similar or better performance? In fact, Debian is better than both Fedora and Ubuntu! Well, this is very simple comparation. Try to play some movie from comercial DVD, try to watch DVB-T or DVB-S channel, try to play MP3 music. Try to play game, like Wesnooth for a while, compare sound quality. Compare available packages in repository. Compare system stability. Fedora has sometimes something nicer as Ubuntu but overall, it cannot compete yet… YUM package manager improved seriously in past months but APT is still few steps ahead. I’ve found that Fedora 10 may use a bit more RAM in a usual install than Ubuntu, but it looks nicer and works better. Ubuntu can’t load the Compiz effects, for example. I use both, depending on whether I’m in a blue or brown mood. I don’t know where the “Ubuntu is bloated” stuff is coming from. Fedora’s more bloated than Ubuntu sometimes; other times it’s the other way around. It depends on what you need and what your hardware does. On mine, Fedora uses way more of my hardware at any time. In the review, I noticed that the ATI drivers worked fine, unlike Ubuntu. This is odd, because Fedora only ships with free software (aka, not ATI drivers). I suspect that your graphics card was supported between the release of Ubuntu 8.10 and Fedora 10 in the open source iterations. That’s nothing if not good news! I don’t think there is much of a difference in resource consumption between the two distros. I do think there is some difference in hardware drivers and graphics drivers that causes Ubuntu to generate more heat. Not sure what is causing this, but my guess is either the graphics driver or ACPI functions not properly and/or optimally throttling power when they can. Looking at CPU traces between the two and other things, I cannot see any really obvious difference, but I can’t say that I spent too much time on it. I did google around for a while and try a bunch of things over the course of a few weeks to get Ubuntu to cool down. Finally I gave up and installed Fedora. I have tried both Ubuntu8.1 and Fedora 10 in my Computer. Both the versions perform very well. But they are for different users. Fedora has a good base but needs to be tweaked properly to put into good use. Ubuntu 8.10 is much of a out of the box performing system with easy provisions for adding commonly used software. Fedora is for users who love to venture and experiment whereas Ubuntu is for starters who need their system to be up and running with common software. I think yum is better, but it requires a lot more knowledge to use it. Dependency resolving is a common problem to all major systems – even things like Eclipse struggle with this. Of course Win-bloze has “dll hell” so it fits that linux has an equivalent. I have installed fedora 10. After reboot cannot load into windows! I have 3 hdd. disk 0 is ide 160 gb. (2 partitions) disk 1 is sata 80 gb. with 3 partitions – win xp/fedora linux/win xp again. disk 2 is sata 120 gb. with 2 partitions.i find fedora works well with geforce 8400 gs. found x.org being troubled in ubuntu 8.10. had same problems booting with ubuntu and mandriva 2009.0 too. Ubuntu works well in my notebook hp dv9000 series. any help please. I would try the regular forums…no clue. Personally I don’t like boot managers and never use them since the old days of OS/2 when I used partition magic. If I wanted a multi-os machine I would use a VM product like xen or VM Ware. you are welcome. Fedora 11 is out and I will have to post an update soon. I used a boot ISO on my wife’s laptop and she was pretty comfortable with it – no training at all. She’s an english major too…so not exactly tech savvy.